Kindle loves this project because... Aalokam is the powerful collaboration between two wonderful Bharatnatyam dance performers, Bharathi Penneswaran and Jyotsna Kalyansundar. 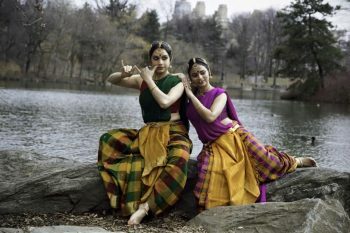 Bharathi and Jyotsna take this classical form of dance to North American audiences while also serving the South Asian communities in New York with their innovative and inclusive Aalokam Dance School. Their commitment to tradition while evoking a wide range of universal emotional experiences with their performances is why we love Aalokam. Our teacher, Justin McCarthy, is a huge inspiration. He grew up in Michigan, saw a Bharatanatyam performance in California, and was so inspired that he decided to learn this dance form. He left the U.S., traveled halfway around the world to India, found himself a teacher and immersed himself in not only the dance form, but the entire Indian experience. Despite not being taken seriously in the beginning, he has persevered to become one of the premier Bharatnatyam dancers in India. We are immensely proud to have learnt from him. No idea, but we never thought we would be dancers. Grow up and stop the hate. Bollywood dance is not the only dance form in India. There are several other classical dance forms, including Bharatnatyam which have existed since 2nd century BC. We would try and collaborate with wide a diaspora of artists and work on a cross pollination of art forms. Breaking into wider audiences and positioning a traditional art form in an constantly dynamic changing modern society. Rich culture and tradition combined with a group of creative performers. 8. What’s your favourite way to procrastinate at work? It would have been rescuing animals. 10. Favourite song right now? Samramina by TM Krishna and Bob Moses’ Tearing Me Up. We don’t believe in any individual activist but anyone who is compassionate who is bold enough to stand for what is right. 14. What do you think is the greatest social issue of our time? Nationalist sentiment throughout the world which is leading to all hate among mankind. 15. What do you think is the greatest environmental issue of our time? Global warming and negligence of recycling waste. 16. How have you changed the world? One of Aalokam’s core activities is education. We offer on-going classes in Indian classical music and dance in the New York City area and the highlight of our school is the emphasis we place on an open culture within our classrooms . We have an inclusive learning environment, a safe space to challenge oneself, increase awareness of body, space, rhythm and expression and through that foster creative freedom to convey one’s story through Indian dance and music. Changing the world by using education and art to liberate oneself by challenging themselves, increase awareness of mind, body and space and reinforce creative freedom to think outside of the box. 17. What book are you reading right now? Game of Thrones and Midnight Children. 18. What is the guilty pleasure show that you watch? 19. What makes you the most happy? Ice cream and sense of accomplishment. Learn more about Bharati and Jyotsna here.